Hello all! Another creation made with something leftover in the stamp room :) That same "last workshop" I stamped a bunch of the flower from Beautiful Day for the ladies to color with the new Stampin' Blends. This one was extra, so I made it into a card. 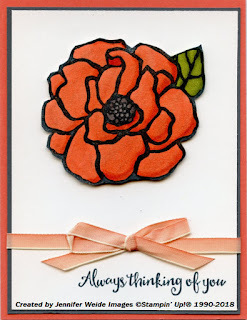 I also wanted to use the Stampin' Blends because I haven't for a while. And, because I wanted to let you know these are available to order once again! The numbers has been turned off due to a supply issue, but that has now been resolved. The initial release had 12 colors, of which 11 are continuing on. And there will be more colors in the NEW catalog!! YEAH!! I chose Calypso Coral because I had a ribbon to match. The flower was stamped with Tuxedo Black Memento ink on Thick White Cardstock. The thick cardstock prevents the Stampin' Blends from bleeding through. I colored the flower all light first, then added accents with dark and blended together. The center is Smoky Slate, the leaf Old Olive. I went over it all with my Wink of Stella Glitter Brush and then cut it out when dry. It is attached to the Whisper White background with dimensionals. 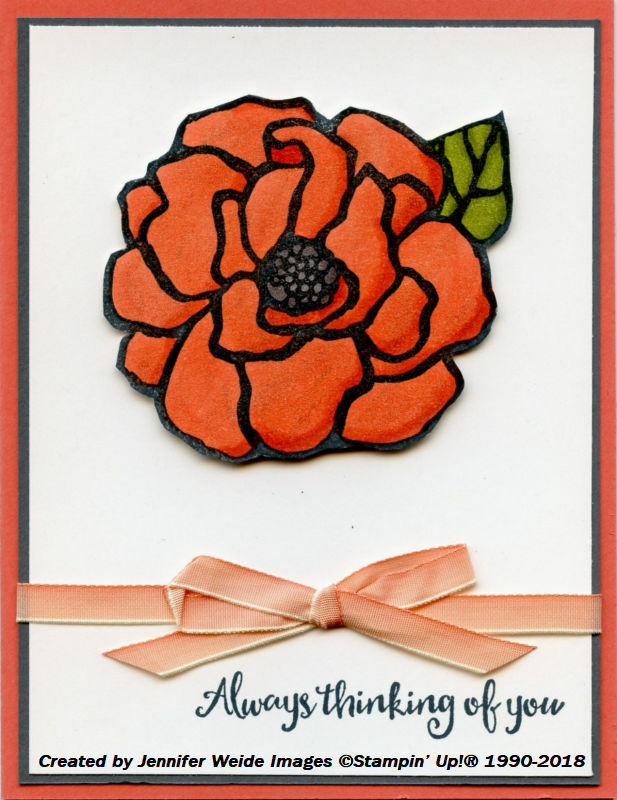 The Whisper White is accented with a layer of Basic Gray and then layered onto the card base of Calypso Coral. On the Whisper White, the saying was added at the bottom, and the Ombre Calypso Coral ribbon knotted around. Quick and easy! Thanks for stopping by! Product links and details below!